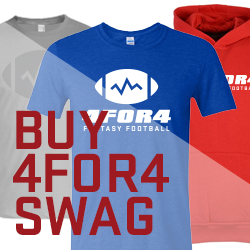 4for4 Fantasy Football is a premium subscription service focused on giving our subscribers a competitive advantage while increasing enjoyment and success in fantasy football. As a leading fantasy football research, analysis and information site, we feature proprietary tools, reports and metrics. These allow us to combine a powerful mix of stats, news, football knowledge and forecasting skills to provide a platform for delivering top-rate fantasy football decision-support solutions and analytically driven content to our subscribers. We focus on subscribers and solving for their needs. We search for elegant solutions to complex problems. We consistently question the status quo. We value accuracy over the outrageous, honesty over spin. We believe in autonomy not autocracy. We must build a product we are proud of and a business we want to work for. We demand a location independent workplace. We focus on what gets done, not how many hours are worked. We strive to be humble, effective, adaptable, remarkable and internally transparent. We recruit, reward & promote people based on these values. We support self-improvement and seek better ways to do things. We fully realize successful organizations don't just happen. They require great people. We believe great organizations are made up of individually talented and successful people who maintain a tremendous passion for what they do. We strive to attract the best people, build effective teams and focus on the needs of our subscribers. Do you have ideas for unique, interesting and actionable fantasy football content? We are looking for well-written, analytical and stat-based articles to feature on 4for4 Fantasy Football. In general, the articles we publish fall into two categories: player/team based research or fantasy football strategy. The articles we are looking for have a stat-based foundation and an actionable conclusion. Have something outside the box? Feel free to pitch it to us. The ideal candidate is a fantasy football enthusiast, stat nerd and fundamentally sound writer. All articles should be complementary in nature to the work 4for4 Fantasy Football is already doing. The ins-and-outs of your projection model may be interesting, but it’s not what we’re looking for (apologies). An interesting pitch: We're looking for you to pitch us a compelling idea, not the other way around. Bring something unique to the table to get our attention. Your background and what you are looking for: What is your experience in the fantasy football space? Do you have an analytics or data science background? What is your education and day job? What is your availability and what sort of role are you looking for? Your twitter handle: Any self-respecting writer should have a twitter presence. It is a requirement. A following is a plus. New to writing? We get asked often what new writers should do to hone their skills and build their brand. Far and away, the best way to become a better writer is by writing. Start a free blog or contribute to one of the numerous free fantasy football sites out there. Most importantly, start writing and write something every day. Get on twitter and grow your following. Hard work and dedication pay off over time. * Core Values and Work Culture inspired by and borrowed heavily from HubSpot and NetFlix.